More Thanksgiving recipe videos in the works this week! 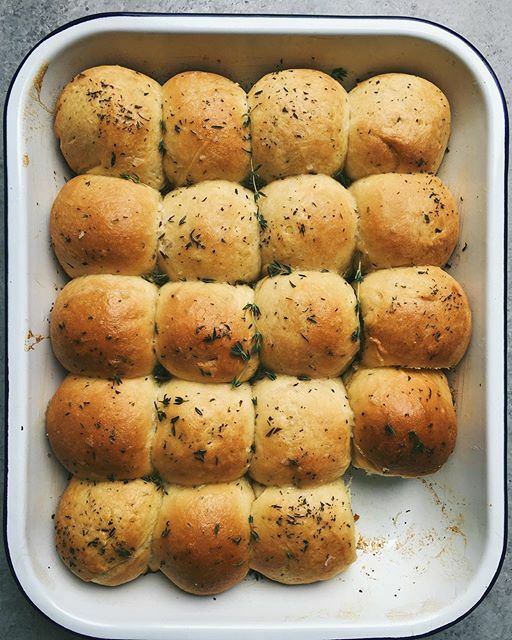 Stay tuned for these buttery and delicious Parker House rolls. In a medium saucepan melt 8 tablespoons butter over medium heat. Add milk and sugar and stir to combine. Using a thermometer check that the temperature of the butter and milk mixture is around 100°F- 105°F. Remove from heat. Add yeast. Stir to dissolve and let yeast bloom for about 5 minutes or until the mixture is bubbly. If mixture does not bubble and smell "yeasty" throw it out and start over, your yeast may not be active. Pour yeast mixture into the bowl of a stand mixer fitted with a dough hook. Add 4 cups of flour. Turn the mixture on low and knead until just combined about 1 minute. Add egg, 11/2 tablespoons chopped herbs, and salt and continue kneading dough on low speed until soft and smooth, adding remaining 1/4 cup flour if the dough is too wet. The dough should be tacky but not sticky. On a lightly floured surface shape dough into a ball then place in a large greased bowl. Cover with plastic wrap and let dough rise in a warm draft-free area for about 1 1/2 hours or until doubled in size. Remove plastic wrap and gently punch down the dough. Cut dough into 4 equal pieces then shape into small balls about 2 oz. each. There should be 20 dough balls in total. Place the shaped dough into a greased 13” x 9” pan. Melt the remaining 4 tablespoons. butter. Gently brush the dough with melted butter then top with remaining herbs and sprinkle with sea salt. Let dough rise 30 minutes. While dough is rising, preheat oven to 350°F. Bake Parker House Rolls for 25 to 30 minutes or until golden brown. Serve rolls warms.